If you are new to mountaineering and looking for some great summits to bag, look no further. These 10 mountains offer first-time mountaineers a chance to put some new skills to the test. Or, for those summits on the list that are more of a hike to reach, chances are they'll provide the impetus to sign up for a basic mountaineering class that will prepare you for more challenging peaks. Please be advised: Mountaineering can be a dangerous pursuit, and taking on any of these mountains should not be attempted without a lot of research and preparation in terms of fitness level and the conditions you'll encounter on the way. For some mountains you should be comfortable with technical equipment and skills such as how to use ice axes, crampons, and how to self-arrest and glissade. You should also make sure you go with climbing partners who are sufficiently experienced to help you on your way to the top. Famous for its recent eruption in May 1980, Mount St. Helens' summit offers dramatic views of the Cascade Range and a chance to look down into the active volcanic crater. Reaching the summit is a hike in late summer when the snows have fully melted, and in the other months carrying an ice axe and crampons is necessary. However, the major summit routes don't require using ropes or harnesses. South Sister, the southernmost of Central Oregon's Three Sisters, is the third highest peak in the state. The views of the Cascade Range from the summit are truly incredible. The route in the late summer, like Mount St. Helens, is a long, sun-exposed hike to the summit, so at that time of year no technical climbing gear is necessary. But be prepared for changing weather and understand that warm conditions down below will give way to wind and cooler air above 10,000 feet. Mount Adams is a great peak to climb to prepare for multi-day mountaineering expeditions. Reaching the summit often requires the use of an ice axe and crampons, but otherwise it is more of a long hike to reach the top at 12,280 feet. Most climbers overnight at Lunch Counter and make the summit push from there the next morning rather than attempting to complete the 6,500-foot elevation gain in one day. At over 14,000 feet of elevation, Mount Shasta is an ambitious climb for the first-time mountaineer. From the top, climbers often glissade down 2,000 feet back to the overnight camp at Helen Lake. Climbers on Shasta have to prepare by bringing lots of water, overnight gear, and protection from high winds, and all that gear adds up to a lot of weight. First-time climbers should go with an experienced guide, be it a friend or a professional guiding service, but other than the exhaustion you'll feel from hauling weight to a high altitude, an ice axe and crampons are all the gear you'll need to reach the summit. Oregon's highest peak is also the second most climbed glaciated mountain in the world, making it the summit of choice for many first-time climbers. Because of the sheer number of visitors, it is also one of the deadliest. This popular mountain is not one to be taken lightly, and climbers must be experienced with ropes, glacier travel, and know how to self arrest. If you are hoping to summit Mount Hood without proper mountaineering training and experience, going with one of the many mountain guides offering trips to the summit is highly recommended. Going solo without proper training endangers you as well as other climbers and is highly frowned upon. Mount Whitney. Photo by Rini Sugianto. Reaching the highest point in the lower 48 is a big draw for hikers and climbers alike. 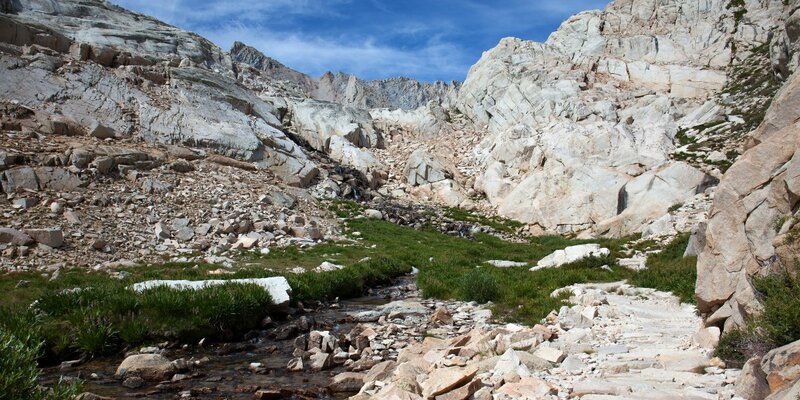 There are numerous routes to the top of Mount Whitney, some much more technical and challenging than others, but the most popular is a long 22-mile hike in via Whitney Portal. Some opt to tackle the challenge in one day, while most spend two days to get sufficient rest and to better acclimatize to the altitude. Due to bears and marmots in the area, bear canisters are required. Golden Ears sits just east of Vancouver, and reaching the summit on clear days rewards with impressive views of the city and Vancouver Island. The path to the summit turns into a boulder scramble along the way up, but it is well marked and no technical gear or experience is needed in the summer. Atop the summit, the views of surrounding mountains is sure to get you planning more climbs and motivate you to bolster your skills for glacier travel. If you are experienced with wayfinding in the backcountry and off-trail travel, Middle Sister offers a more challenging and less crowded alternative to South Sister for a first-time mountaineering experience. The trail is hard to follow and unmarked, and there are two options for those with different experience levels with glacier travel. Lingering snow is possible late into August, making an ice axe and crampons necessary. The final steep section of the route to the summit is also on an unstable rocky slope, making travel slow going and at times precarious. The summit of Idaho's highest peak is reachable on a relatively short but steep hike up its southwest ridge. The crux of the hike is on a knife-edge appropriately named Chicken Out Ridge about two-thirds of the way to the top. For most snow years, the base of the ridge is often covered by a snow bridge, requiring the use of an ice axe and crampons to cross it. For those who make it across Chicken Out Ridge and continue on the steep, rocky trail to the summit, the views from Idaho's high point are spectacular. ​A final option to consider for a first-time mountain climb is Mount McLoughlin in Southern Oregon. The summit is the highest point between the Three Sisters to the north and Mount Shasta to the south. The trail to the top requires climbing over large, volcanic rocks, but no technical gear is required to reach the summit in the summer months when the snows have melted from the mountain's flanks. I'd take Mt Hood completely off this list. I agree it's a easy beginner climb to Hogsback, but as you mention, it requires ropes, training, and skills to reach the summit ridge. Including Hood on lists like this (beginner climbs) also contributes to the amount to of visitors which increases the danger. Nice list. But Bears Ears is EAST of Vancouver, not west.